Basturma is one of those things that has a lot of memories for me. Piling up in the car, heading to the Armenian side of town, into the deli. The wafting smell of spices. Hot fresh crunchy French bread, tangy garlic sauce, crisp pickled Persian cucumbers, and lots of thinly sliced spicy salty Basturma. 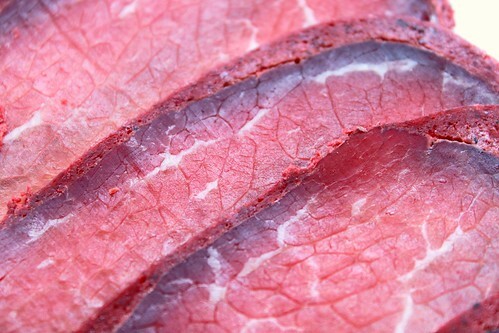 Ok, so its not technically pastrami, but it is related. It is originally a Turkish dish, and was adapted by many including Albanians, Arabs, Greeks, Armenians and Lebanese. 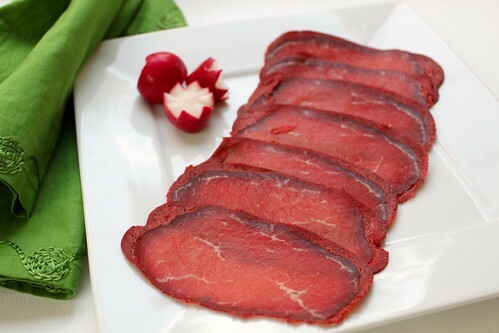 Bastourma, or Pastirma, is simply a cut of meat that is dried and cured with a mix of spices. The process is not as simple and has many steps. I don’t know the exact recipe, but it starts out with salt curing it for days to pull out all the moisture. Letting it dry, by putting weights on it. Then, cover it in a paste of crushed cumin, fenugreek, garlic, and hot paprika, followed by thorough air-drying. The paprika should be spicy. This whole process does not take less than 3 weeks. I have never made it myself . 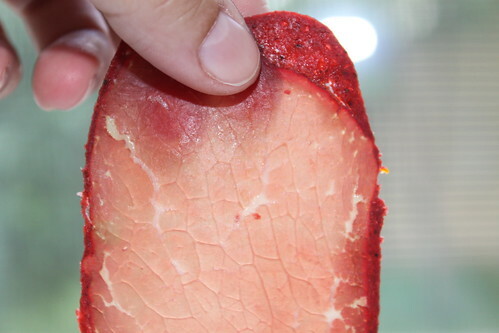 It is available at a local meat market, and it’s sold for around $9.00 a pound. I buy 1/2 a lb and ask the butcher to slice it real thin. I don’t dare buy more because it really doesnt last around me, lol. I start munching on the thin translucent buttery slices the minute I’m in my car. 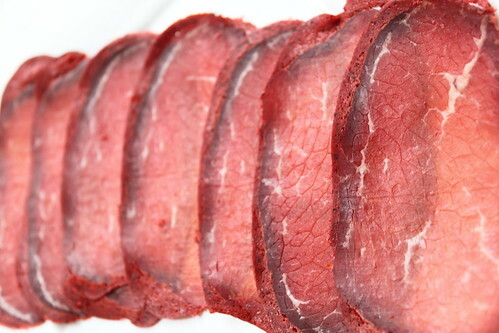 The soft beef, with fat ribbons has a salty addicting taste that is just punched up with the spicy thick paste on the outside. When it does make it home, its great with eggs in the morning, or just simply on a pita with some mayo. Just don’t blame me if you get addicted. ++Mira++ posted this article under appetizer, in the kitchen	on Sunday, August 22nd, 2010 at 7:47 pm	You can follow any responses to this entry through the RSS 2.0 feed. You can leave a comment or trackback from your own site. View Technorati Linkbacks. Previous Article ← Top 10 Best Apple iPhone cakes – Steve Jobs eat this! This article has 35714 commentshttp%3A%2F%2Fwww.mirauncut.com%2Fbasturma-lebanese-armenian-pastrami%2FBasturma+-+Lebanese+Armenian+Pastrami2010-08-22+23%3A47%3A29%2B%2BMira%2B%2Bhttp%3A%2F%2Fwww.mirauncut.com%2F%3Fp%3D357 so far! Thanks for such informative post! 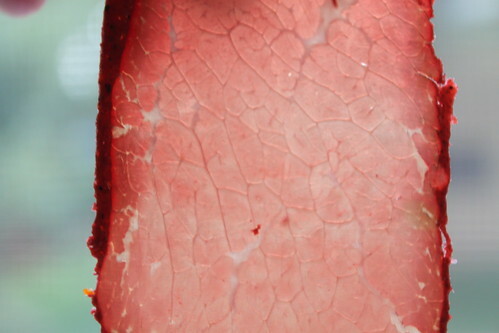 I've always heard of pastrami, but have never really figured out what seemed so enticing about it. Now that you've pictured it clearly (and beautifully, if I may addd), it certainly sounds enticingly delicious! That looks delicious and intriguing…Where do you buy it from? oh I love bastirma ! Is it me or its a fact..following a consumption of the red gatro next am i can smell it in my arm pits for days..
I\’ve heard of that…but, thankfully never happens to me. Depends how much you eat of it I think.